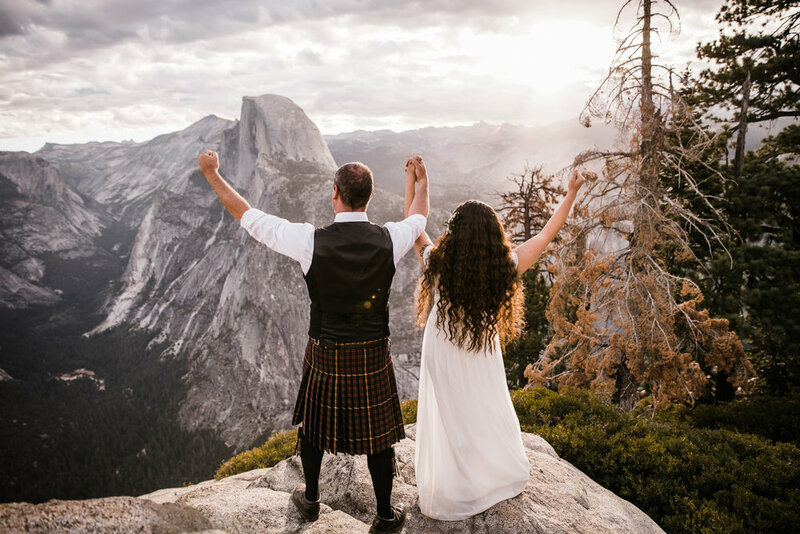 This is the story of an epic elopement in Yosemite National Park with The Hearnes Adventure Photography. 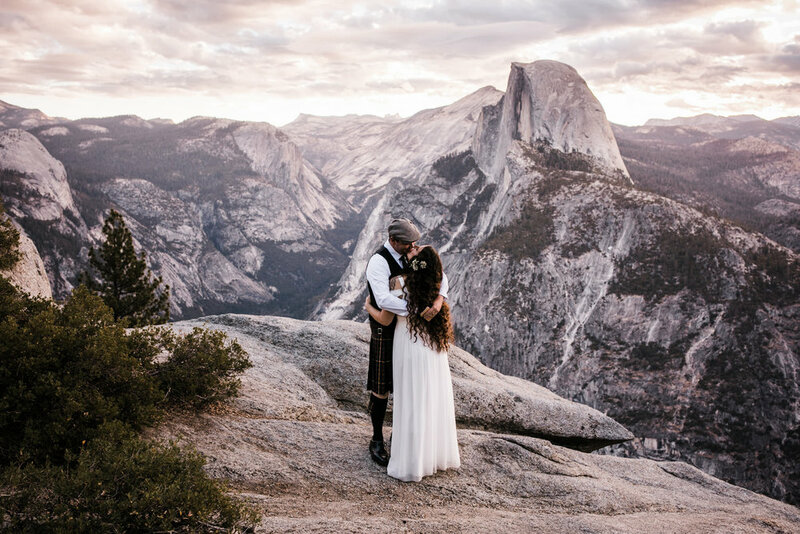 The Hearnes specialize in adventure elopements all over the world, but Yosemite National Park is one of our all time favorite places to explore, and it’s a wonderful place to elope! 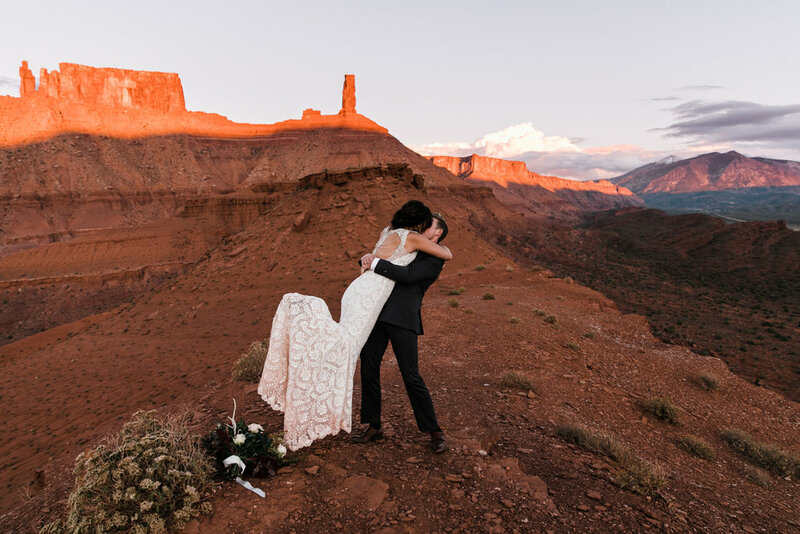 Josh and Emily, preparation, unsafe conditions, changed plans, and trust - it took all of this to capture one of the most surreal moments we've ever witnessed. You wouldn’t think a few things "going wrong" would lead to Josh and Emily having one of the most epic sessions of our career. 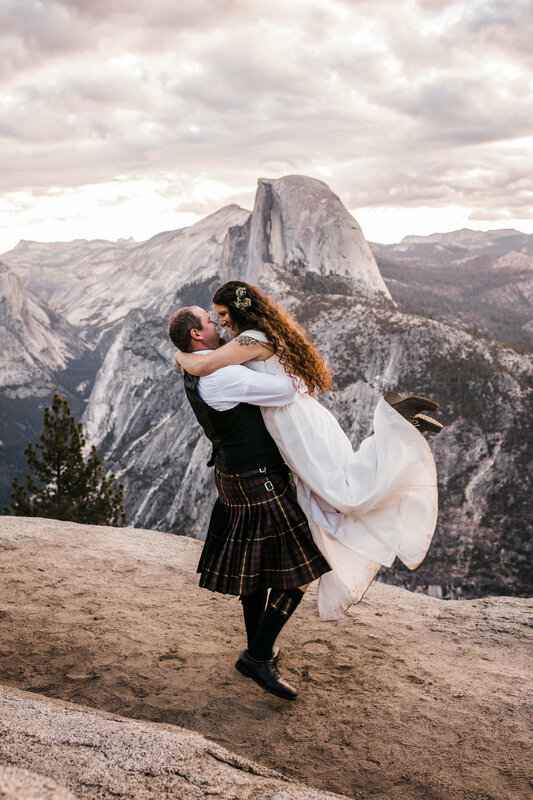 In fact, a photo from their day which had many unexpected changes ended up being picked for one of the biggest honors we've received - earning one of Junebug Weddings Best Photos of 2018. 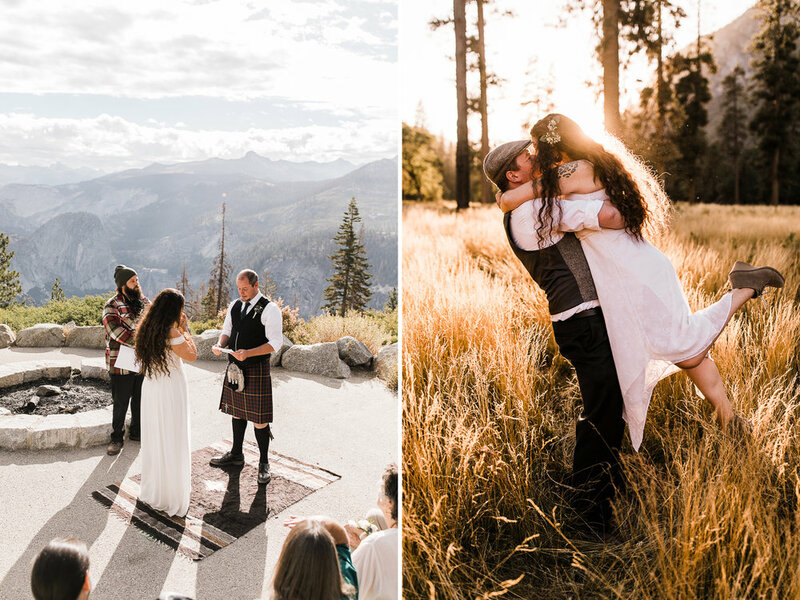 Before we get to the story, let me tell you two things about being an adventure wedding photographer. 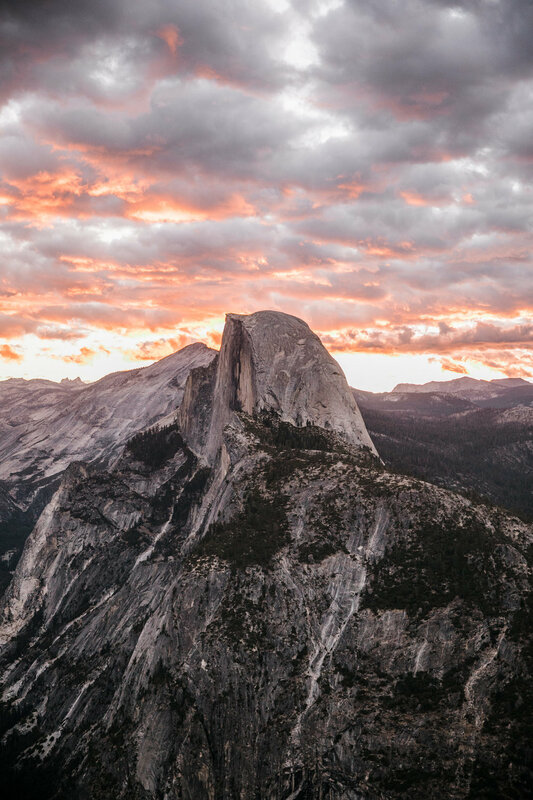 First, one of the most important things about the job is the ability to plan - know the park rules, about permits, and about leave no trace principles. 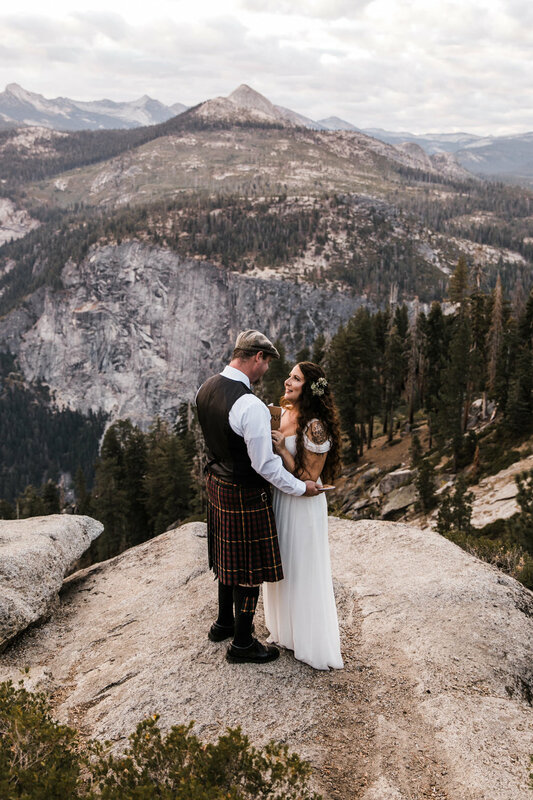 Know park rangers, visit a BLM office and talk to them, ask the questions you might have well in advance so you can put into place what it takes to keep your couples and yourself safe. To do your best work, you also need to be more than vaguely familiar with an area. You need to know the ins and outs. 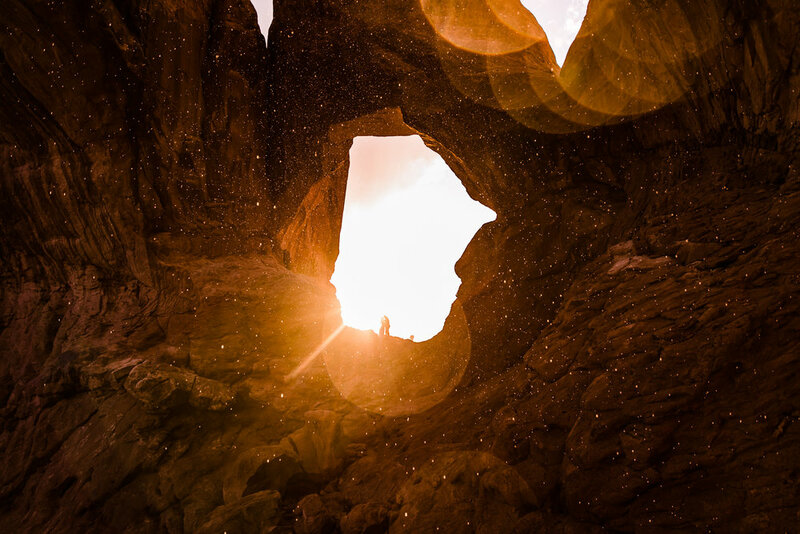 Know details about the light and not just what it's doing right now, but all of the things it might do, because shooting in Zion vs. Yosemite vs. Alaska is worlds different. You have to be ready if there are no clouds or some clouds or if you're completely socked in. You should plan around what peak the sun is going to set behind, know exactly when the sun will rise, and how all these factors change depending on the time of year you'll be shooting. Secondly, know when to adapt. 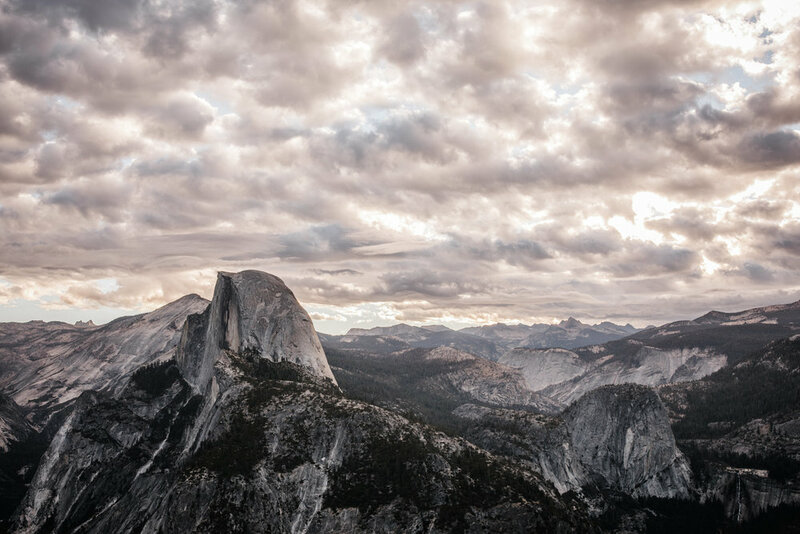 There will be times when something comes up - a wildfire or a closed road, a hike that's way busier than usual (maybe you need to hit the trailhead at 4 am), but the most common is the weather. When situations come up, you have to be able to confidently trust your knowledge, experience, and skill set - all of which give you that gut feeling you have to go with. Josh and Emily put so much trust in us to plan their wedding day. I can't overstate how much this means to us. 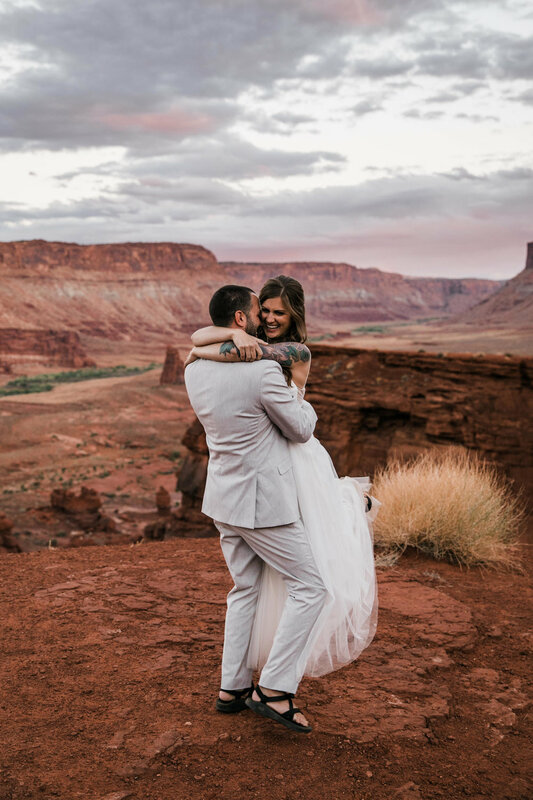 It's especially true considering they wanted their adventure wedding in Moab, which is basically our backyard. 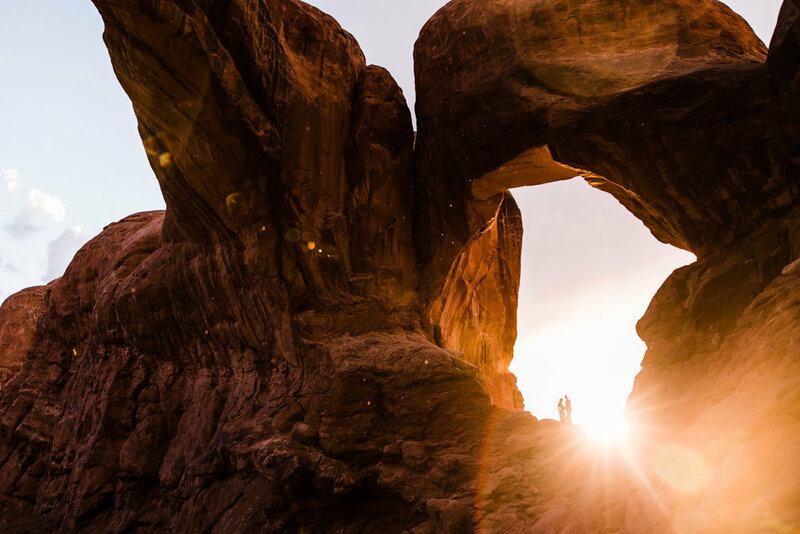 We've spent as much time here as anywhere, and I know the weather can change pretty quickly in Moab. A week before Josh and Emily's shoot the forecast said there was a chance of rain. The prediction of a storm out here can switch to clear skies and vice versa overnight, so we waited. 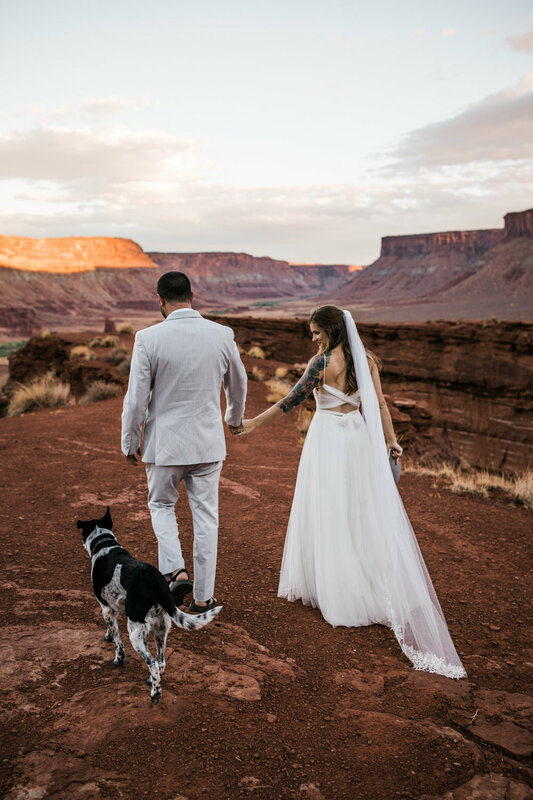 The crux was the original plan we made to run a slot canyon for their elopement. Any time there is rain, there is a chance of a flash flood in a canyon even if the storm isn't close or happened the day before. Twenty-four hours before the shoot and the weather report still called for rain. We needed to change our plan. I know the pictures we take of our couples up on the edge of a cliff can sometimes cause people to gasp a little. The thing is, we almost never need to tell our couples no because we don't say yes to stuff while planning or shooting which could carry real danger. 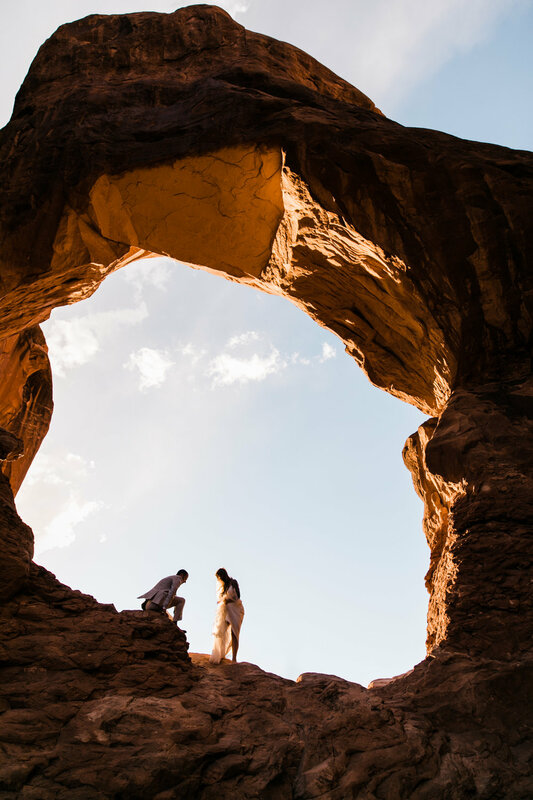 Our couples often want a shot on an edge, and we'll help them find a safe spot to do so and pursue on their own, at their individual level of comfort. 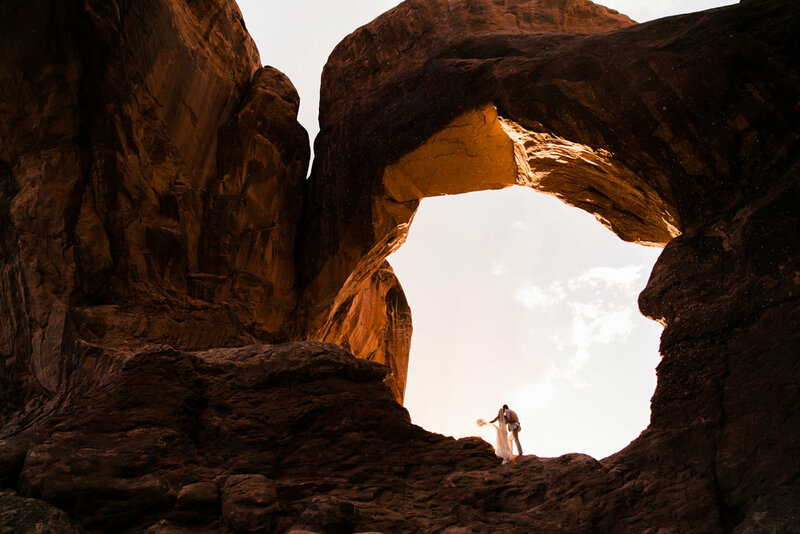 However, when it comes to things like avalanche safety in the mountains of Alaska, the wind in Patagonia, or a flash flood in a slot canyon in Utah, it's our job to know and prepare for the risks which didn't exist when a plan was first made. The truth is (and consider that this comes from a couple who loves jumping out of perfectly good planes as a hobby) some things just aren't worth the risk. Flat out, we prioritize safety over any epic shot. So we had the plan but now was the time to adapt. Again, Emily and Josh had so much trust in us which made the next part way easier to become so great. We didn't know it at the time but the rain and danger of a flash flood in the canyon and the last minute change of plans resulted in our most epic shot of 2018. When we got in the car, it did end up looking pretty stormy, but there was a little break in the cloud cover near the horizon. I was hoping some golden light might sneak through. 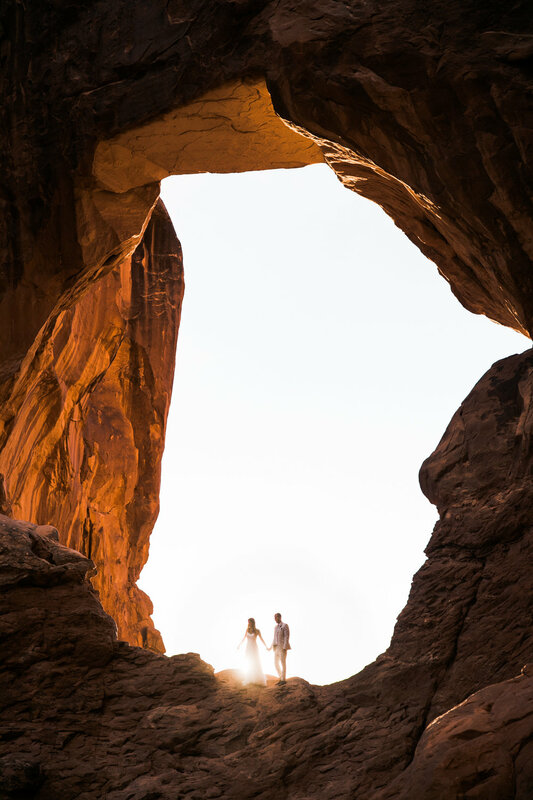 Let me also say this - I didn't use to shoot adventure elopements in Arches National Park too much because it can get pretty packed with crowds. 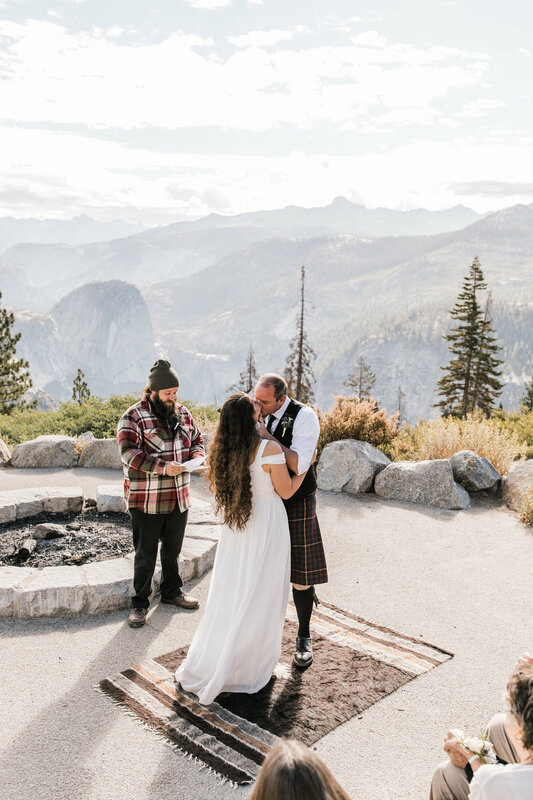 I ended up learning our couples loved hiking in the park and people loved seeing them walk by in their wedding clothes. I thought the silver lining to all this was that Josh and Emily would have a lot fewer people at the park because of the weather. Little did I know, as Callen wound up the switchbacks of the entrance to Arches National Park, we were on our way to experience some desert magic. I knew even if the sun didn't come out the photos would be pretty epic. Moab can be great in any condition. 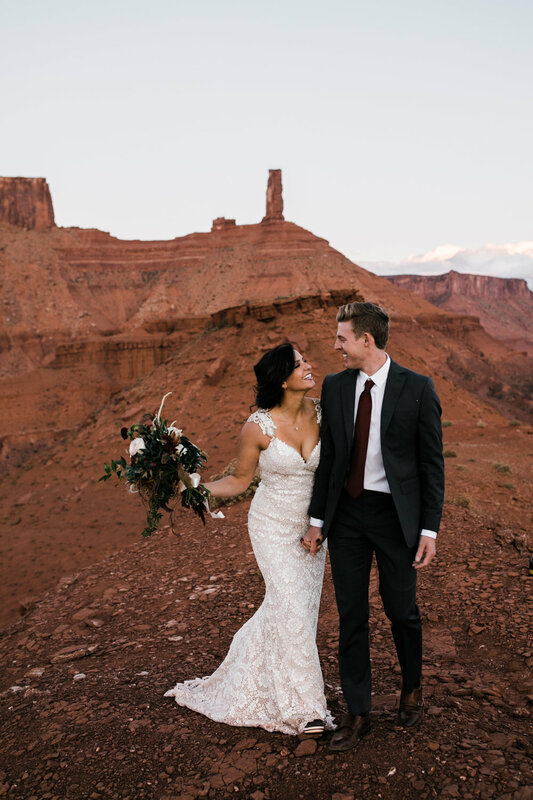 The 2,000+ arches in the park provides so much for a photographer to frame a shot with and the sandstone rising from the earth provide natural contrast, punchy shadows, and the endless skies stretching over the earth in every direction allow for so many beautiful options. 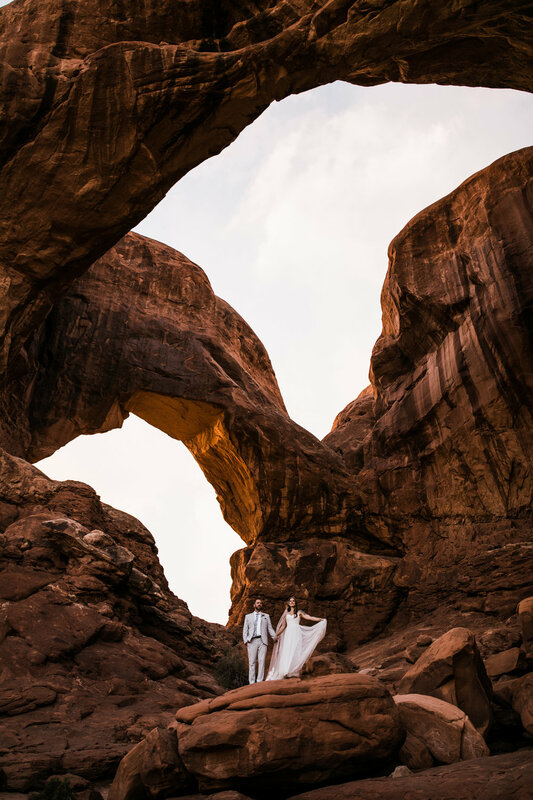 We have a huge list of locations Callen and I have explored, and I picked one of my favorite spots knowing, if the sun did sneak out below the clouds, we could snag some cool light shining through the arch. Okay, enough about safety and photography concepts and everything going through my head that day. I just wanted to give you a true look into the preparation and decision making which can go into a single evening of shooting. It's important to remember that no matter what is happening, through trust, preparation, and knowledge, there is a way to put yourself into a position where you have an opportunity to use your skills as a photographer to capture something great. As we piled out of our cars, Emily and Josh were so excited which put a lot of peace in my mind. They were so upbeat and happy even though we were in a completely different area than they expected a few days ago. It kind of hit me then- Josh and Emily met at the camp Josh ran, where Emily now works, where kids with serious illnesses go to just be kids. They're literally pros at taking a hard situation and making it into something beautiful. A new wave of appreciation for them hit me. I was witnessing a couple who can bring a calm presence in any storm, whose love for people and each other isn't dependent on circumstance, and I just had a good feeling about them, about the shoot, about the whole day and what I do for a living in general. We walked the trail and the sun still wasn't coming out, but the layer of clouds still left us a good chance. 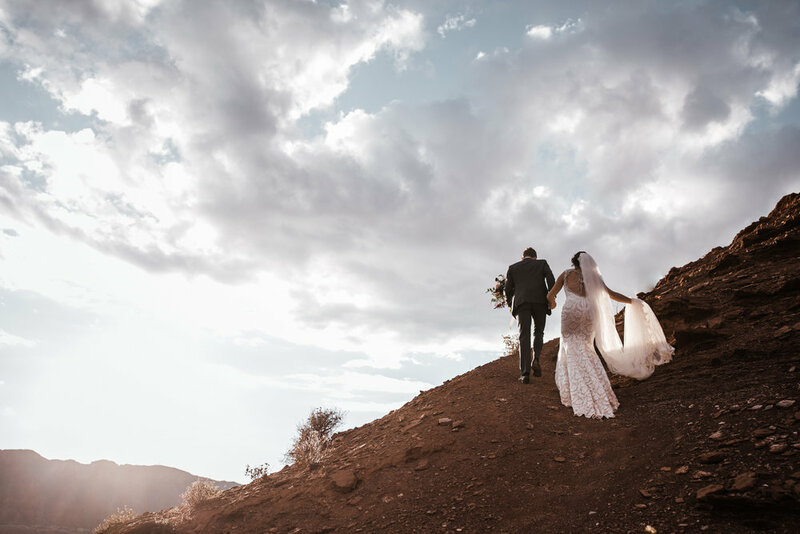 Emily's dress and her beautiful veil were perfect for the hike, and Josh wore a light grey suit that contrasted the red rock beautifully. They climbed up the sandstone to the little perch under the arch I directed them to. Callen took off behind me to get some shots a little further out. 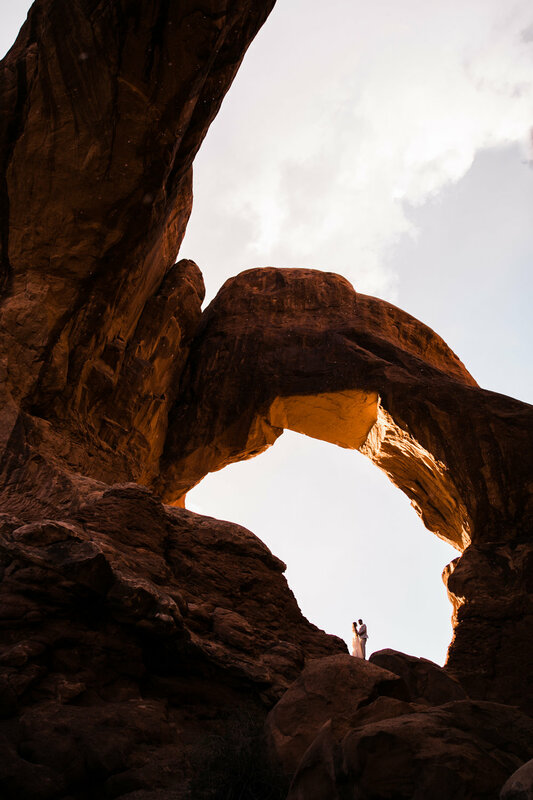 Emily and Josh walked across the ridgeline below the arch. I felt a drop of rain or two, and then it really started coming down. 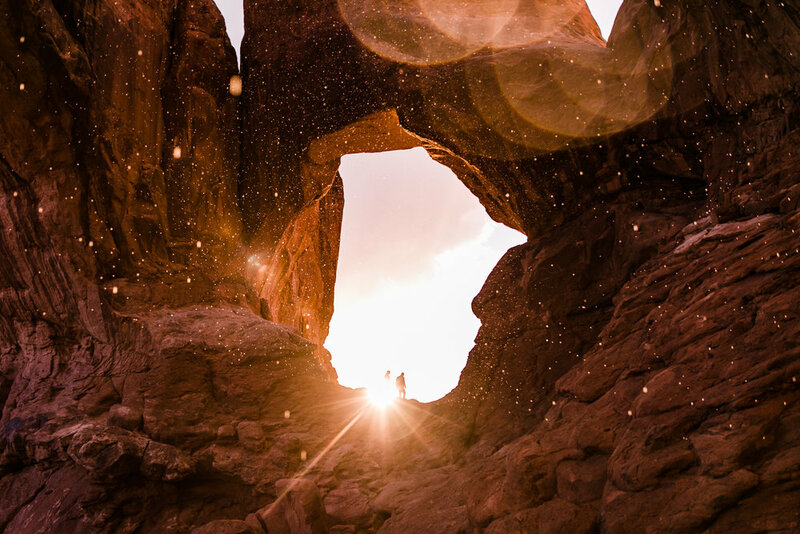 Then, just as they reached the bottom trough of the arch, the sky began to light up. 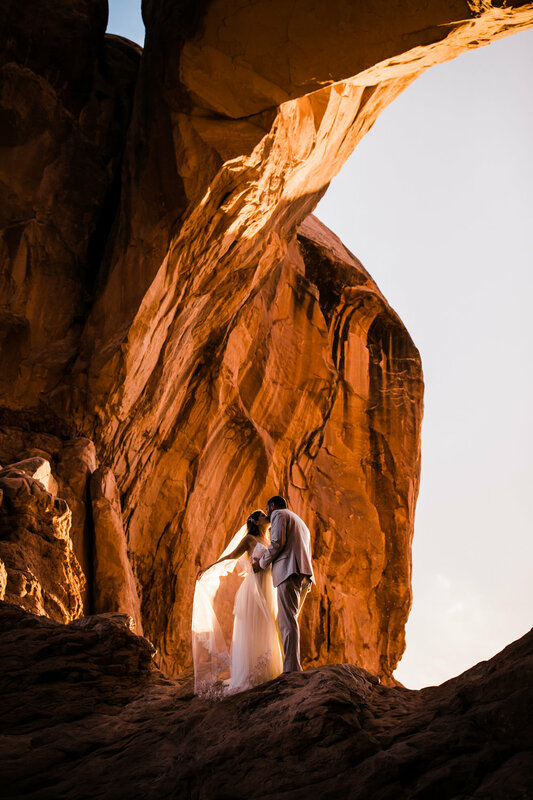 The sun was coming through the other side of the arch perfectly, backlighting Emily and Josh. I was already stoked on it all, but then the phenomenal happened. The rain got a little heavier, and the drops falling through the sky became drenched in the golden light that was peaking out under the clouds. I knew Callen was behind me. I yelled back asking if he saw it too. He did! This type of thing is so unique. I'd never seen anything like it and wondered if it would register on camera. Josh and Emily were in complete awe. The scene was completely surreal. Eventually, the rain stopped, but the light kept shining through the arch. 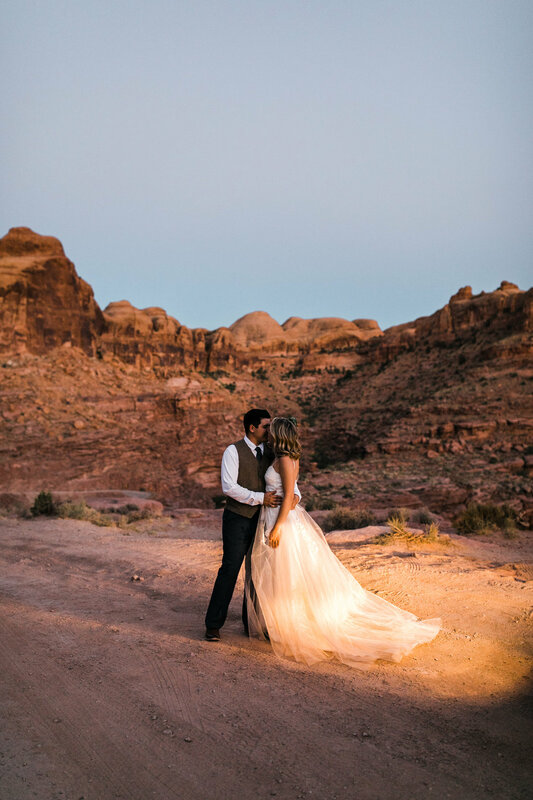 The sunset made Emily's dress glow, Josh gave her kisses and held her hand as we climbed down and explored a little more. Later that night I got to take a look at Callen's photos and was blown away. You can tell when I'm stoked on something because I just blurt out words like "oh my gosh" and "no way" and "Callen!" when going through the photos. The rain had not only shown up but looked like glitter falling through the sky. The images perfectly captured what we had witnessed. The next day Josh and Emily picked us up in a Jeep for a 4x4 excursion through a more remote corner of Moab. We picked out and made a mental note of a spot for their vows at sunset and kept exploring, stopping a few places to take pictures. 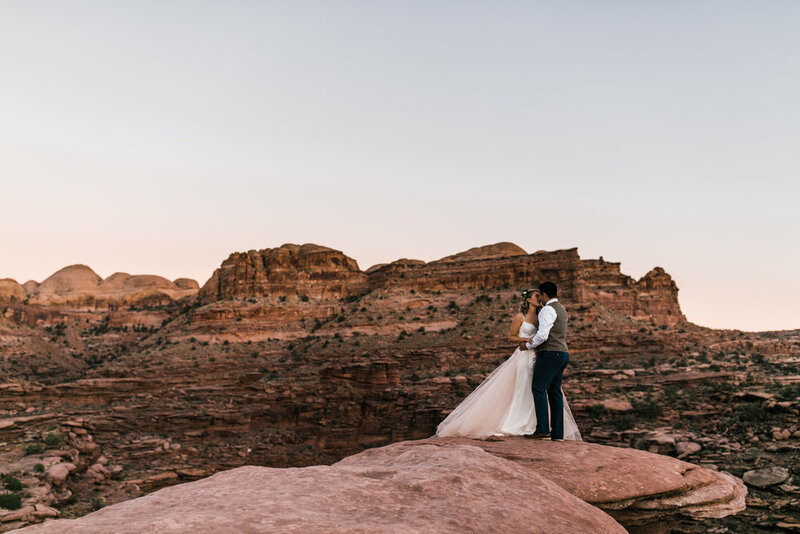 Eventually, we found a perfect little place overlooking the Colorado River for some sunset shots. 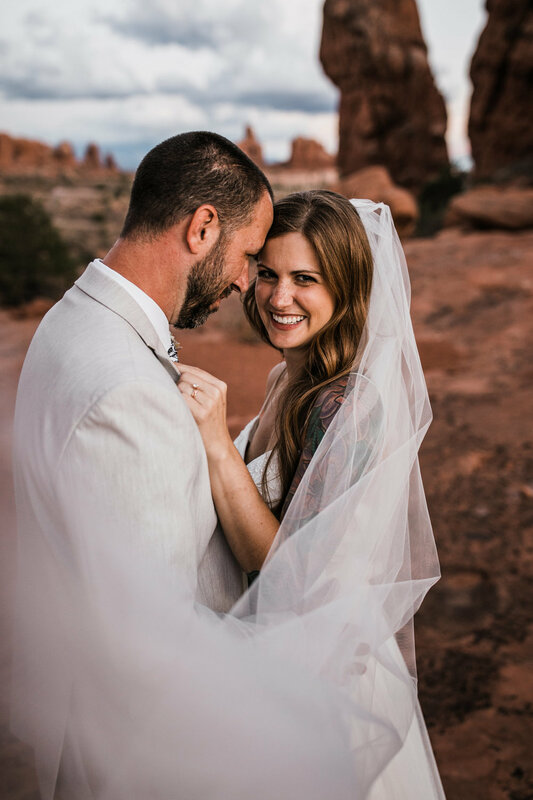 The light was perfectly Moab, shadows of monuments cast against western walls of the canyon, and Josh held his wife close. They looked beautiful; the couple that could find the beauty in any storm, the ones who put their trust in us, the ones who lit up under a natural phenomenon. We drove back to the spot they chose to give their vows and gave them some space to have time to themselves. I can't lie though; I would have loved to hear what this couple had to say to each other. What I do know is the day was fitting for them, who they are, what they do, what they love, and experiencing the beauty we did was something special. I think, in all our professions, we work hard to do our best; we bring out the best in ourselves to bring in a bit of beauty in the life of another. Whether by a sick child being able to truly smile in the midst of a personal storm, a family being able to feel happiness or providing an experience to a couple in love to not just stay safe but witness a once in a lifetime moment with each other - all the soul we pour into what we do, every bit of effort - it is all so worth it. You know that episode of The Office (if you know us, you know The Office/Parks and Rec references happen pretty much daily) where Jim and Pam get married? We find out at the end of the episode - after their actual ceremony - they already got officially married at Niagra Falls. They did it because it's what made sense to them. 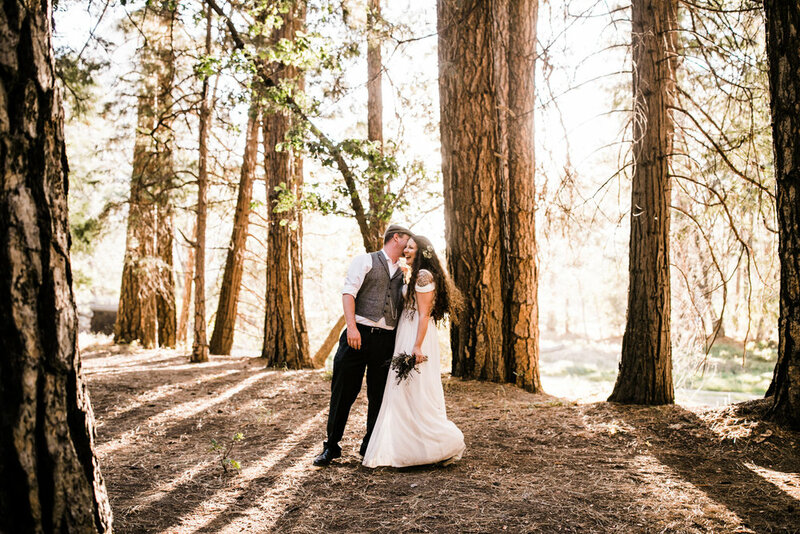 So many of our couple have tweaks to their day to make it completely theirs. Helping them with their vision and making sure our couples get to explore the options which make the happiest is a passion of ours. This was exactly what happened with Cassie and Chris and how we came to shoot what we dubbed the "Jim and Pam" session. After meeting through a mutual friend, we knew pretty quickly we'd be great buds. 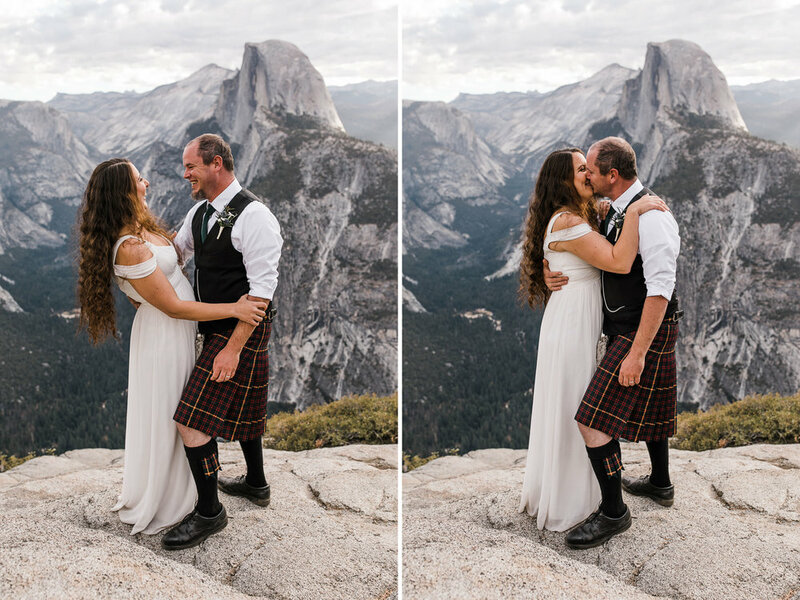 We ended up shooting their engagement photos in Yosemite and from there, Cassie and I talked about the possibility of shooting in Moab. 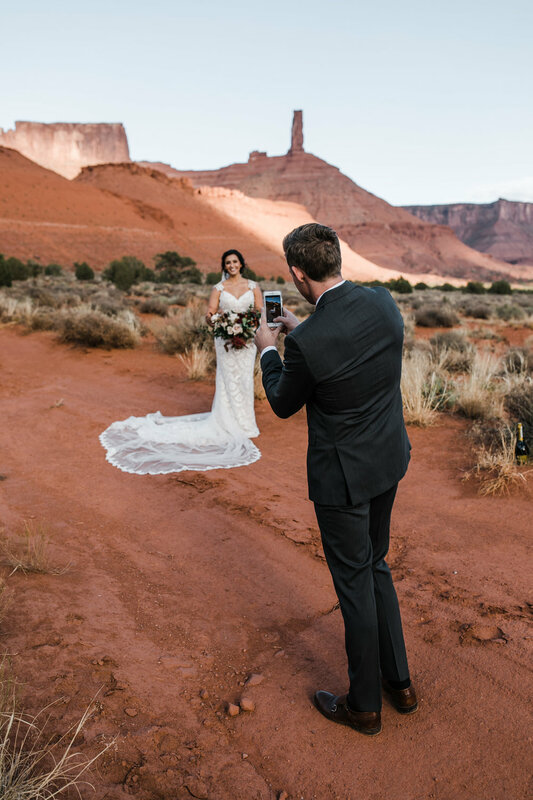 She loved the idea of desert photos, but they also wanted a bigger ceremony in Colorado for all the people who mean so much to them to come and celebrate. 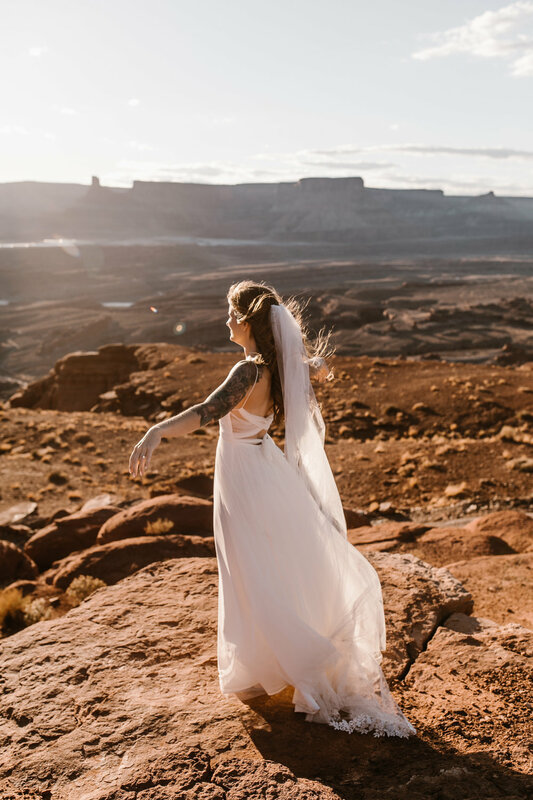 So, when I mentioned a first look session in Moab, she was totally in! 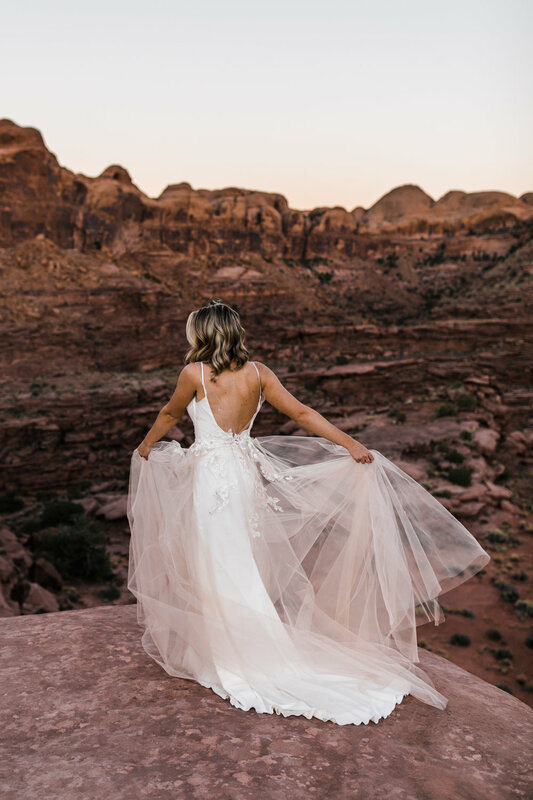 When we met up in Moab, Cassie changed into her stunning Galia Lahav dress in the camper (which we laughed about as Callen was still vacuuming up the glitter a couple of days later). 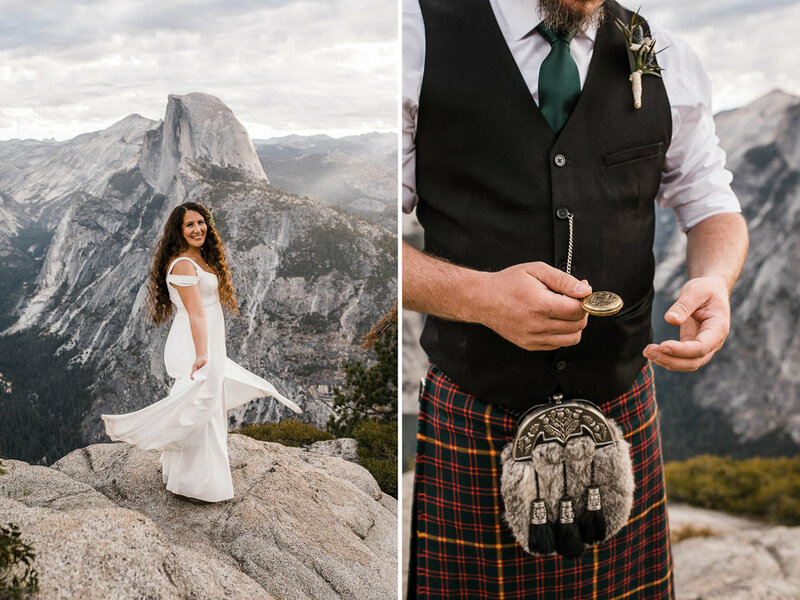 Then, because Cassie was an absolute trooper with her super heavy dress, we hiked up to a beautiful little spot overlooking my favorite valley for some photos. Chris was glowing at the site of his bride, and it was such a relaxed time. 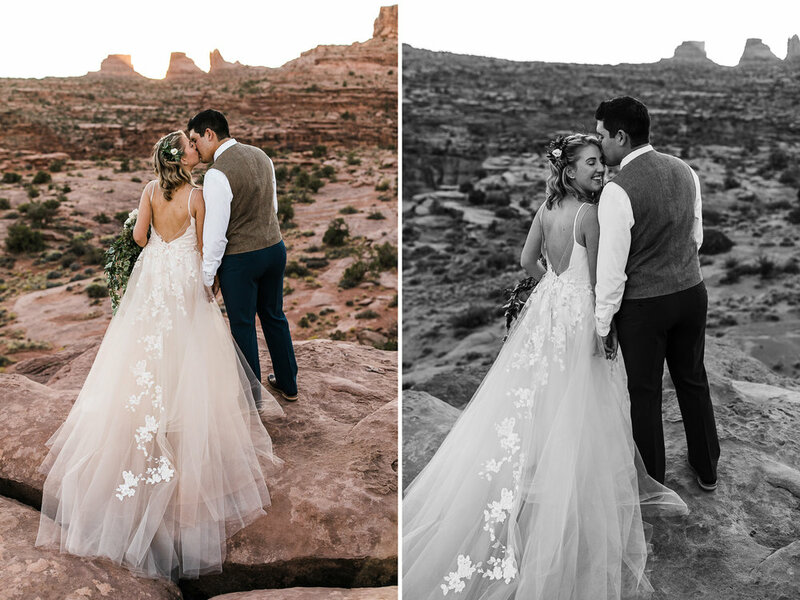 With no particular agenda, we wandered around the red rocks, took time to laugh, and did some fun shots with Cassie's AMAZING Galia Lahav veil. 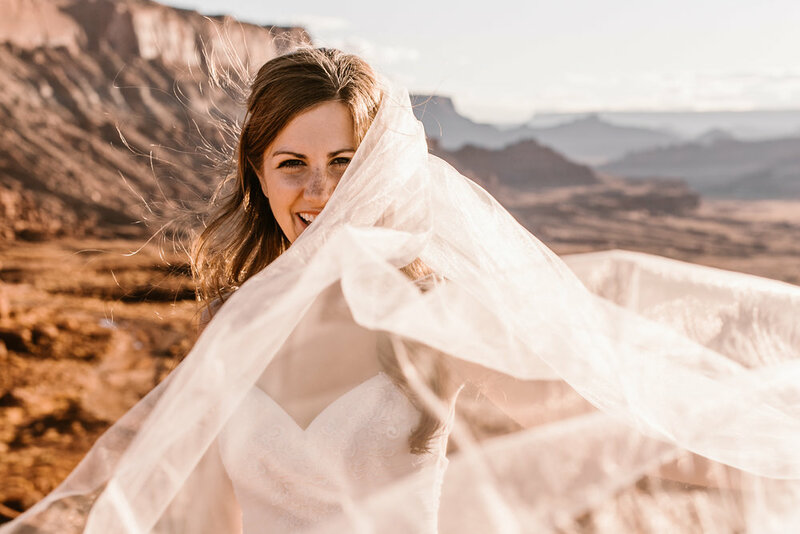 We need to stop and talk about this veil - a perfect mix of a fabric crafted by angels and worthy of a desert goddess, basically the Ann Perkins of veils. Seriously though, I love long veils in nature, and this was one of my favorites ever. 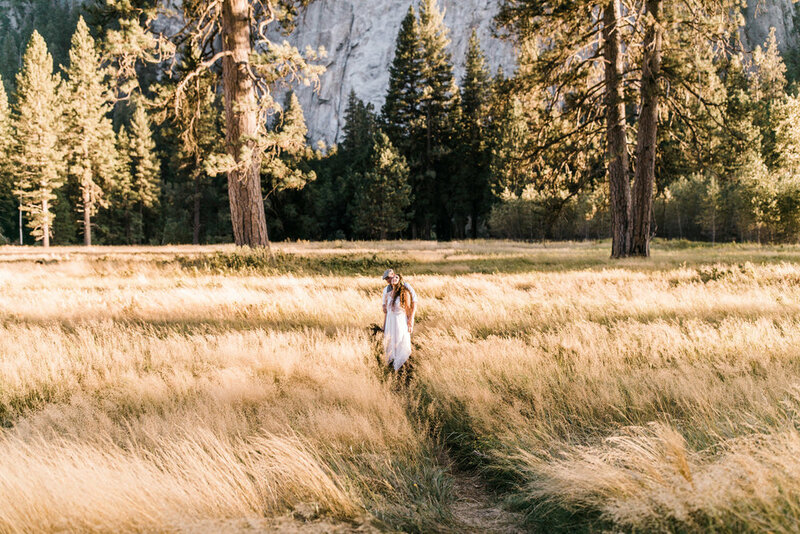 The best part of shooting their engagement and wedding photos in California, Utah, and Colorado was watching Cassie slow things down. 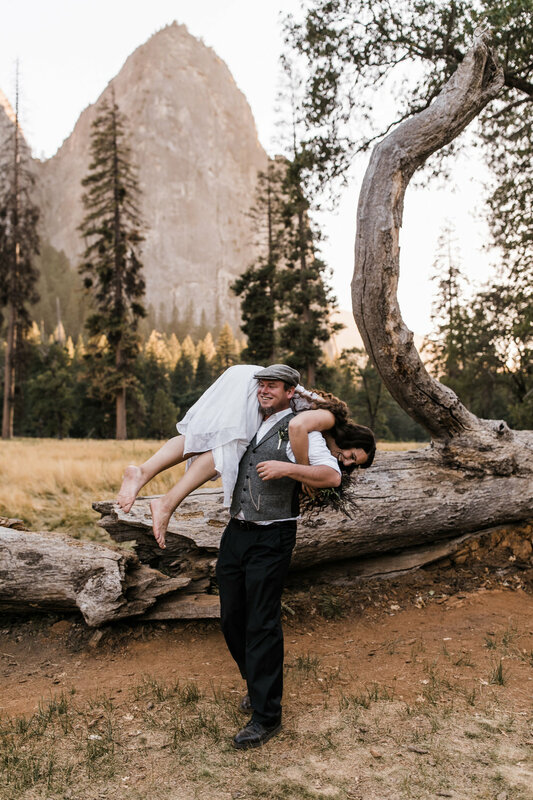 Wedding days are amazing and for some, the movement and motion of the day is part of the fun, but that pace wasn't what Cassie and Chris wanted most. 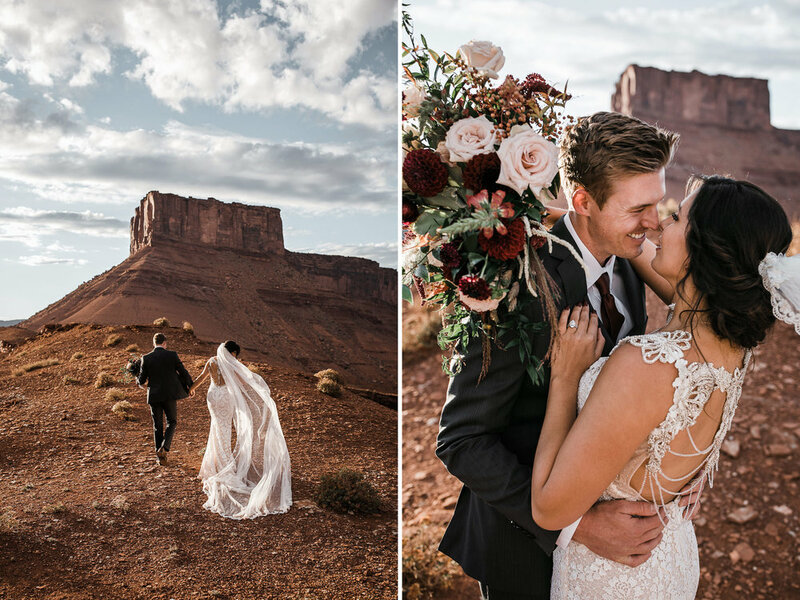 So these moments in Yosemite for engagement pics and Moab with Chirs in his suit and Cassie in her stunning Galia Lahav dress among the desert towers in Moab was perfect for them. 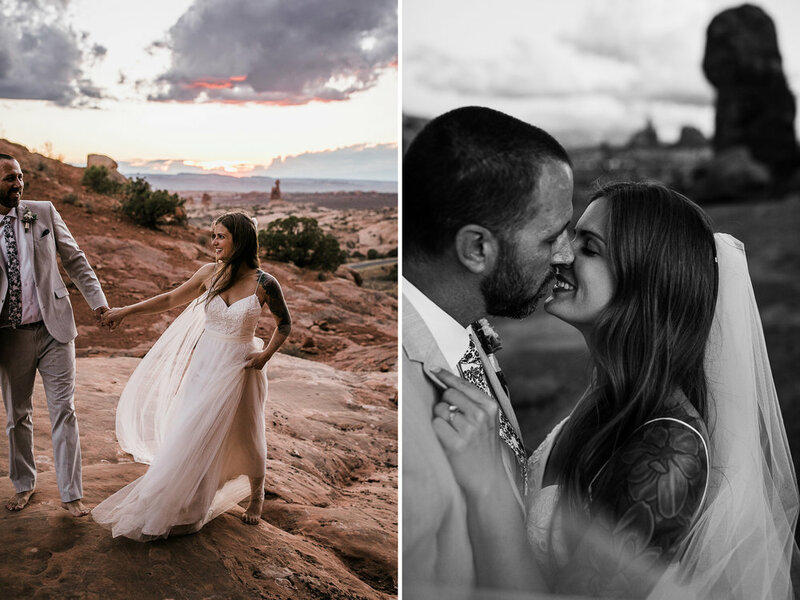 On their wedding day in Colorado, Chris and Cassie got to focus on the day itself, the friends, and the little moments they could take their time with because they had most of their photos done days before. Cassie talked about how doing things this way melted a lot of her wedding day stress. After getting most of her photos done, she just focused on the moments she really wanted to with her friends and family. 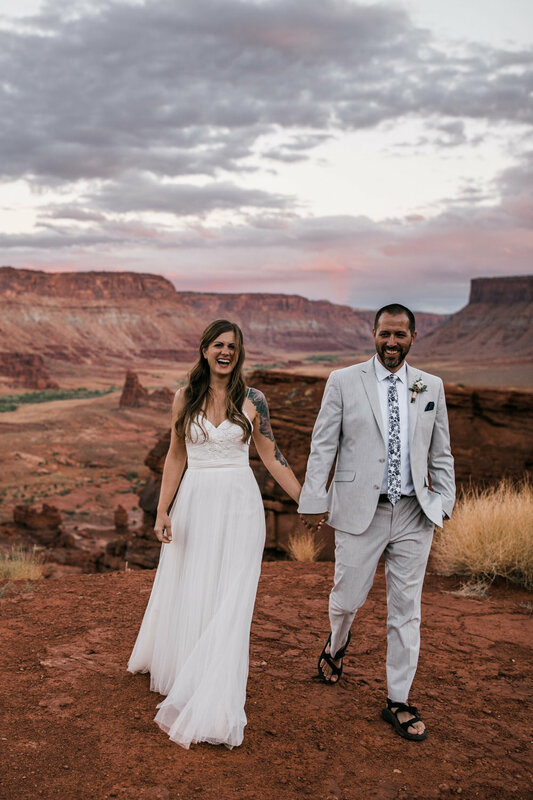 Plus, we got to have them all to ourselves on this day in Moab ;) These two are now stuck with having us as friends for a lifetime, which made me all the more happy to do this for them. At the end of the day in Moab, we went to some food trucks for pizza, Thai food, and donuts. We sat there eating all this crazy food (perks of being an adult) before heading out with friends to party. I couldn't help but think about how worth it all this is, how lucky I am to have people like this in my life - people who will travel a thousand miles to climb granite and deserts, who will get their dress dusty and want to hang late into the night, who will make sure to include everyone they love without giving up any wild dream they have. It's so worth it. 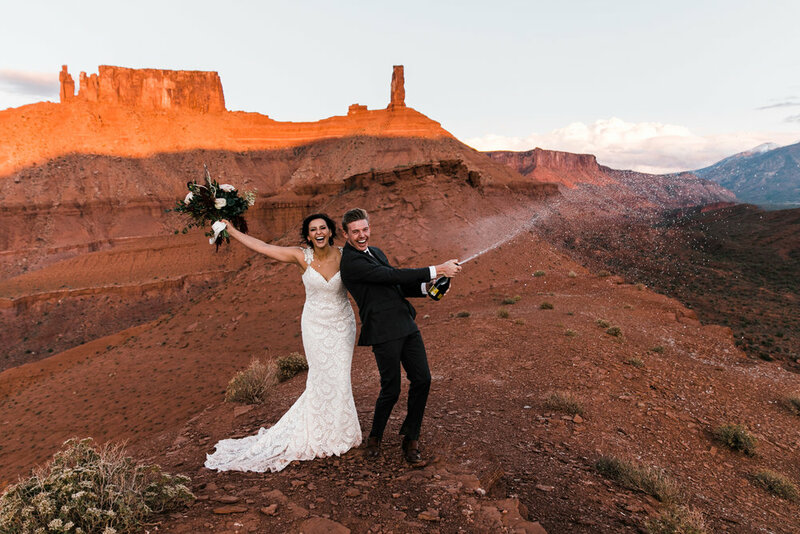 As follows with most Moab adventure weddings Sam and Zac's wasn't your typical reception. Dust kicked up in the light coming from the headlamps of Sam and Zac's Subaru, illuminating the desert dance floor. Instead of a DJ's light set up, there was the hazy dusk light right before the stars come out. 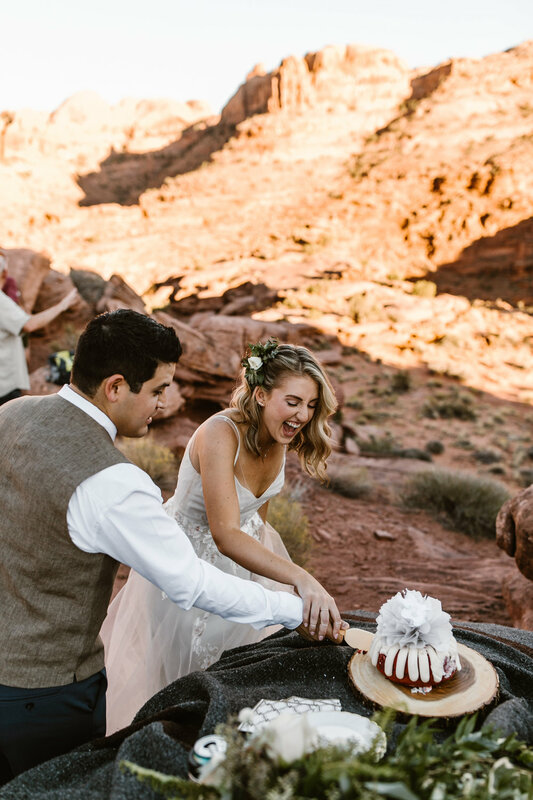 Instead of an extensive guest list and a huge cake, there was a couple in love eating red velvet cake in the middle of a red desert. Sometimes, simplicity shows what a million plans and months of work is trying to say - this, is love. 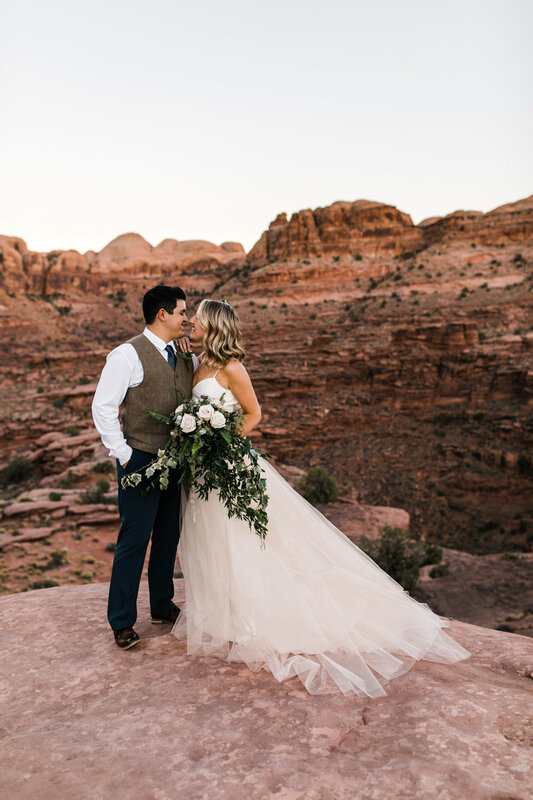 When Sam and Zac came to us, we understood their idea, the desire for a simple day, their personality speaking towards the serene calm and beauty the desert brings. 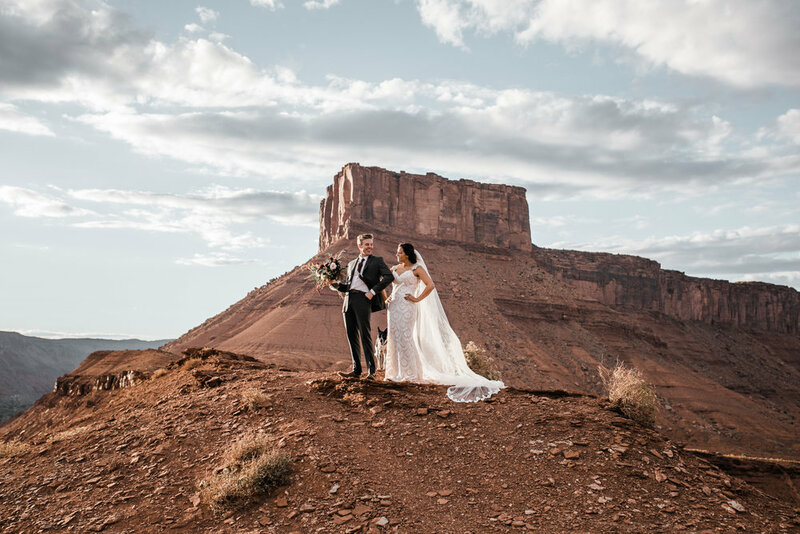 They're rock climbers, and thus campers and hikers, so their adventures had taken them to Moab before, and ultimately drew them back for their wedding day! 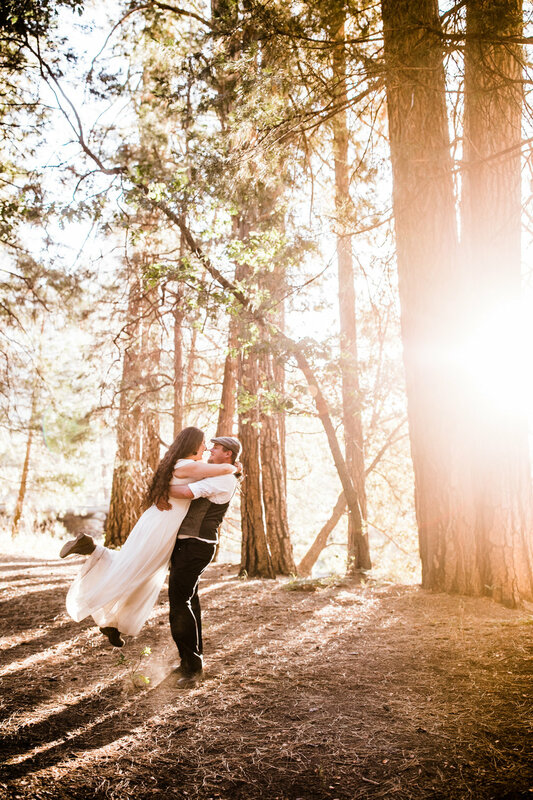 When we started talking about their elopement the thread of simplicity that brought their whole day together started when they thought that Callen and I should pick the location for their ceremony. 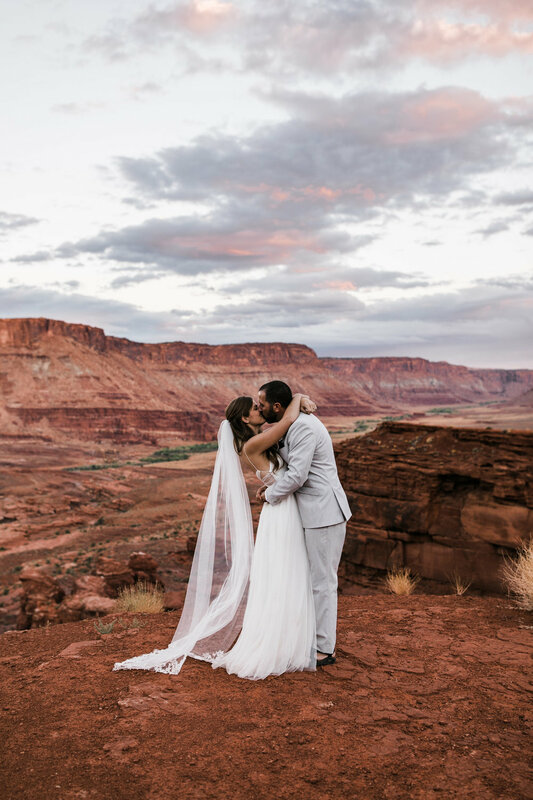 You can argue there's not a bad place to get married in Moab, but it means a lot to us when couples trust us so much. Picking out a special place for a couple to say "I do" is something I look forward to doing every time. 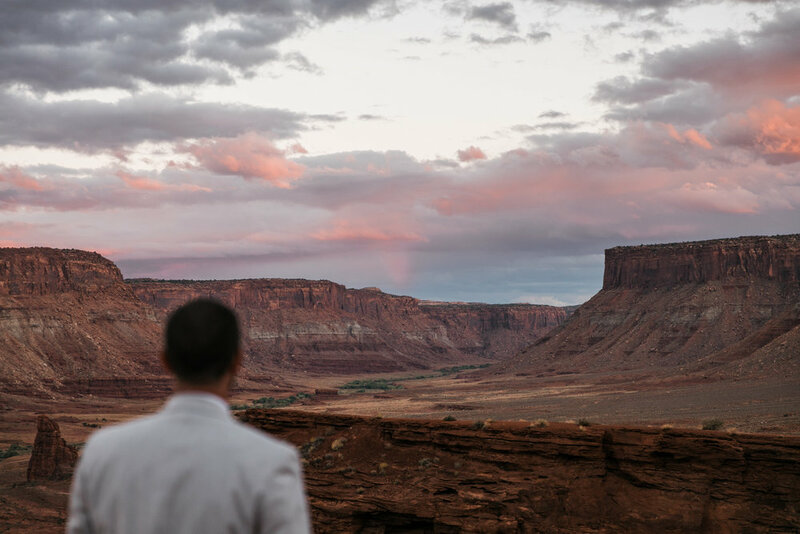 With the amount of land and roads leading to various textures of valleys, towers, and canyons, the challenge isn't to find a uniquely beautiful place, but rather to pick one. 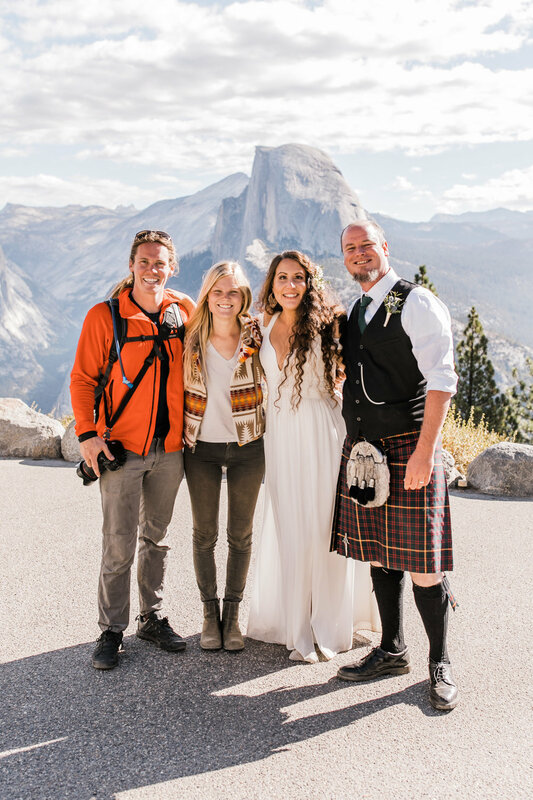 The fun thing about our adventurous brides and grooms is how often we can feel their joy coming through in every situation. This joy isn't always there because they have every detail planned out, but because there is a freedom in knowing nothing other than it will be beautiful. This brings about the feeling of spontaneity and excitement which makes up a lot of what adventure is. So when we met Sam and Zac for their first look, we could tell they were excited that the exact location was still somewhat a mystery. I often not only think about where our couples would like to go, but where they would want to come back to for years to come. 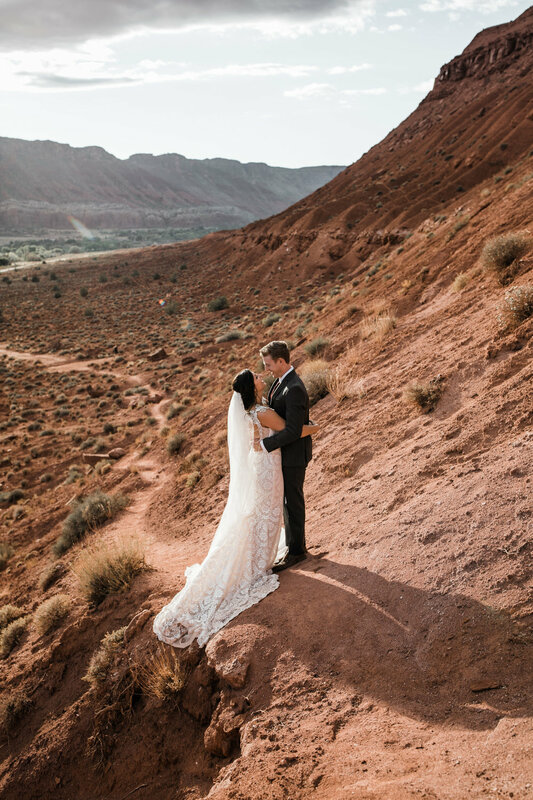 We knew the area we would go to, but there was still room to hike out and pick the specific ledge unique to them with the perfect backdrop for their wedding ceremony. Today, Conner (brother/artist/Strickland) officiated their desert elopement, and Zac and Sam's parents served as witnesses. The ceremony was short and sweet, and right afterward we had a picnic reception. There were beers and the aforementioned red velvet cake. 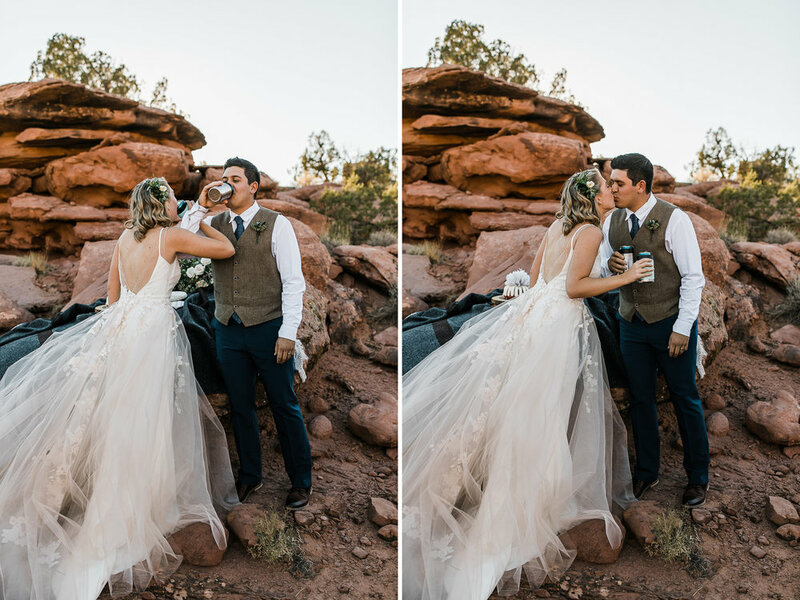 Their parents, the only witnesses to the wedding, gave the sweetest toasts to their newlywed children. We used the last of the light to hike around and do sunset portraits. There was a purity in the day. The day felt like underlining your favorite sentence in a story and then writing a whole book using that sentence as the plot. 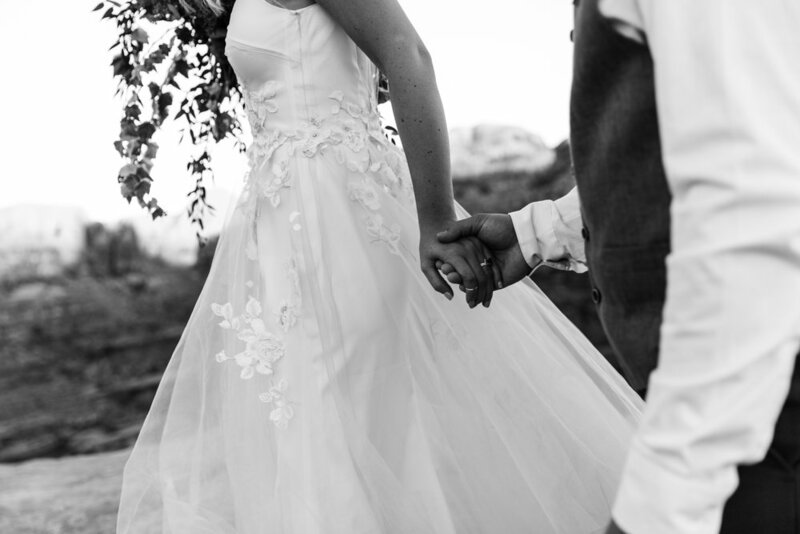 That's kind of what we do, and today felt like the purest - simplest - form of what we do for our couples. Their day showed how happiness comes from finding what you love - the people and the places, and underlining them like favorite sentences before writing it all into your story. 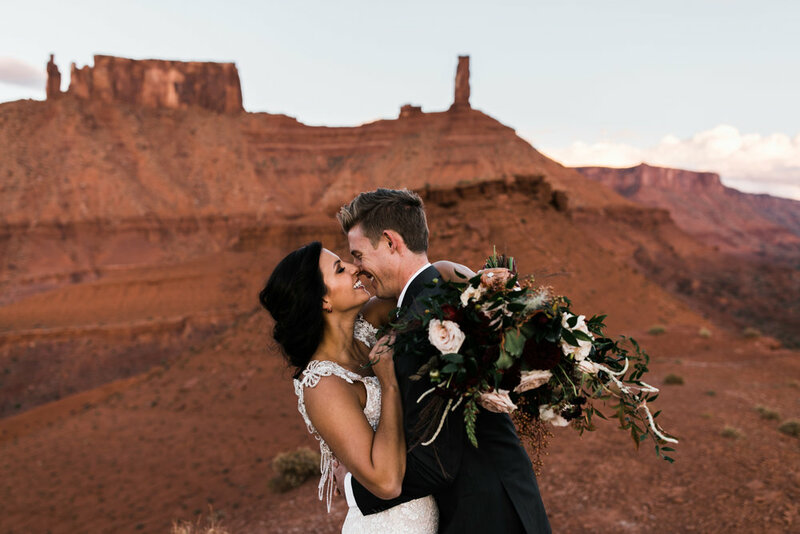 The sun had set over the desert, mountain bikers rode by, and the day ended with a couple holding hands, moving their feet and kicking up dust, proving anywhere you dream up can make for the perfect dance floor.